Our Shuttle service from Port St Lucie serves over 40 destinations in Florida, offering a daily shared transportation and private transfer service to all major airports, seaports and cities in between. Our intercity transportation service is very affordable, flexible and convenient for your travel needs. Port St Lucie shuttle bus service is part of a state wide corporation called Florida Shuttle, a top rated passenger transportation provider in the state of Florida. 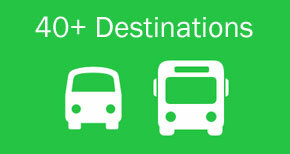 Covering over 40 destinations throughout the east and west coast with excellent customer service. The most popular services are: Port St Lucie to Orlando, Port St Lucie to Cocoa Beach, Port St Lucie to West Palm Beach, Port St Lucie to Vero Beach among other cities: Miami, Kissimmee, Stuart, Port Canaveral and more. Also, we offer airport and seaport transfers as well. When using our most economical Port St Lucie shuttle service, you can now travel to anywhere in the East Coast of the state of Florida through I-95 with comfort and ease. With our Port St Lucie private transportation offers a flexible and convenient intercity transfers. you may travel to your desired destinations at anytime and anywhere. Our Port St Lucie shuttles, give you the flexibility and opportunity to travel between all major cities, airports and seaport in Florida. Including our Port St Lucie private transfers. When traveling in our Port St Lucie shuttle bus service the most commonly used routes that almost all ground transportation companies use is (I-95) OR Florida's Turnpike. Currently, we do not offer door service in Port St Lucie with our shared shuttle bus service. Port St Lucie FL nearby airports: Miami International Airport, Fort Lauderdale international airport, West Palm Beach international airport. We also serve in Orlando international airport and Orlando Sanford airport. Florida is by far, one of the most visited state within the United States and very popular across the globe due to its wonderful theme parks, beautiful lakes, eye catching places and of course the soul soothing beaches. Travelers, tourists and also locals prefer to visit different places within the state instead of traveling some where else. So, if you're planing for a family or friend vacation there, we would recommend you to visit the Port St Lucie﻿ Official site and/or take a look at our Travel Blog below for more information. Enjoy and Bon Voyage! If you intend to know more about Port St Lucie FL, its historical places and things to see and to visit, you may visit Port St Lucie ﻿Wikipedia for more information about Museums, historical places and fun spots.